Following a competitive selection process, over 190 Australia Awards Scholarship recipients from South and West Asia will join 1.5 million students at Australia’s world-renowned higher education institutions. Scholarship recipients from the region include 68 from Bangladesh, 14 from Bhutan, 29 from Nepal, 8 from the Maldives, 35 from Pakistan and 36 from Sri Lanka. Australia Awards offers Scholarships based on merit, transparency and equitable access for all. People with disability are encouraged to apply for Australia Awards Scholarships and recipients with disability are supported to achieve their educational aspirations. This year, 12 recipients with disability were offered Australia Awards Scholarships. During the selection process in Bhutan, Australia Awards employed a sign language interpreter when interviewing a candidate who is hard of hearing. Mr Yeshi Gyeltshen subsequently received an Australia Awards Scholarship and is expected to commence his Masters at the University of Melbourne, specialising in Deaf Education; including an introductory program on Australian Sign Language. Deputy High Commissioner to India and Bhutan Rod Hilton, addressing a reception to congratulate new scholars. Australia Awards employed a sign language interpreter during the event. Addressing a reception for newly selected Australia Awards recipients and Australia Awards alumni, Dasho Karma Tshiteem, Chairperson of the Royal Civil Service Commission and an Australia Awards alumnus, said ‘Not many people living with disability receive scholarships as it requires a lot of hard work for the scholarship provider. Australia Awards are highly sought after because of the prestige, strong support by its processes, and high importance given to social equity factors such as gender and disability’. ‘Having worked with children living with disabilities, I realised that they are very vulnerable and have varying learning and support needs. A specialisation in Special Education will help me support children with special needs to achieve their full potential’ says Mr Cheten Tshering from Bhutan, a new Australia Awards scholar who will be undertaking a Master of Special Education at Flinders University. Australia Awards provides necessary tailored support for selected applicants to ensure reasonable adjustments to assist scholars with disability. Another key consideration in the Scholarship selection process is gender equity and social inclusion. Among the scholars starting their study in 2019 are 106 female scholarship recipients, representing 55% of the total. ‘Receiving an Australia Awards Scholarship is an amazing opportunity for me as I strive to continue to learn and improve myself. My studies on International Development focusing on Gender Studies will enable me to challenge the power dynamics with more knowledge and sensitivity’, says Pakistani scholar Ms Wjiha Afsal, who will be studying at the University of Melbourne. Australia Awards has achieved a milestone in Pakistan with females comprising more than 60% of the recipients; while in Nepal, 58% of Scholarship recipients are female. Australia Awards has also offered pre-course English in Nepal to selected applicants as an enabling activity to ensure gender equity and social inclusion. Prior to their departure to Australia, High Commissioners and Ambassadors hosted receptions to bid farewell to the scholars and congratulate them on their achievement. ‘There were four reasons I chose to apply for an Australia Awards Scholarship. Australia is a great country to live in; Australia Awards has an inclusive support system in place; and the alumni response was great. Finally, I have never come across a scholarship program that not only cares about the scholarship recipients, but also about their families’. says Ms Drishya Gurung from Nepal. Ms Drishya Gurung, Australia Awards recipient from Nepal. 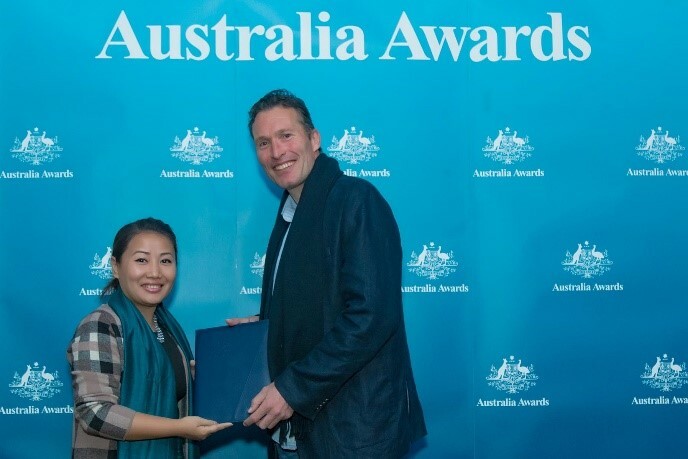 She is pictured above receiving the Australia Awards certificate from HE Peter Budd, the Australian Ambassador to Nepal. Prior to accepting her Australia Awards Scholarship offer, Drishya was offered another international scholarship. She opted for Australia Awards. In Bangladesh, a reception was held to bid farewell to the 68 new Australia Awards recipients and also to welcome 40 alumni who had recently completed their studies and returned home. Australian High Commissioner to Bangladesh, Her Excellency Julia Niblett, encouraged the scholars to embody the Australia Awards ethos to ‘Make a Difference’ by being courageous, adventurous and inspiring positive change and strengthening the links between Australia and Bangladesh. Mr Nasrul Hamid, Hon State Minister of the Ministry of Power, Energy and Mineral Resources, and Chief Guest at the event thanked the Australian Government for continuing to support Bangladesh’s human development. Scholar from Bangladesh Zarin Yesmin Chaity says ‘I want to address the gaps and contribute towards creating awareness on climate change and disaster resilience starting from the country’s curriculum, reaching up to the national level. I believe the exposure I will gain through Australia Awards will help me achieve this dream’. At the reception in the Maldives, Australian Deputy High Commissioner to Sri Lanka and the Maldives, Ms. Victoria Coakley, encouraged the new Australia Awards recipients to make the most of the opportunity and continue to make significant contributions to the growth of the Maldives. Chief Guest at the event, Mr. Abdul Ghafoor Mohamed, Foreign Secretary to the Ministry of Foreign Affairs (who is also an Australian alumnus) expressed his support and appreciation towards the program. 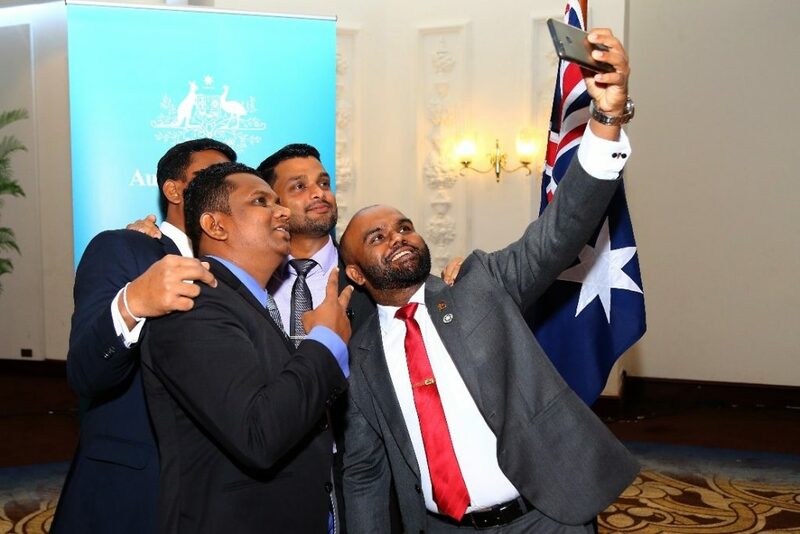 In Sri Lanka, the group of new Australia Awards recipients include a positive representation of numerous government agencies and private sector organisations. Addressing the Farewell Reception hosted by the Australian High Commission in Sri Lanka, Chief guest at the event, Mr Ravinath Aryasinghe, Secretary to the Ministry of Foreign Affairs, expressed gratitude towards the Australian Government for its continuous support towards the Sri Lankan people and the nation’s development. Scholar Ms Fathima Shimla said this Australia Awards scholarship will help draw on a range of expertise towards the development of the country. All Scholarship recipients will be undertaking postgraduate study to further equip them with knowledge, skills and networks so that they can contribute to the development of their countries. To help prepare them for success, the new scholars will be provided with support before, during, and after their Scholarship. Australia Awards are prestigious international Scholarships, Fellowships and Short Courses funded by the Australian Government. They offer the next generation of global leaders an opportunity to undertake study, research and professional development in Australia. In the last five years alone, more than 1,000 Australia Awards Scholarships have been offered to individuals in South and West Asia to study in Australia. As of 31 December 2018, there were over 6,700 Australia Awards alumni from South and West Asia. Australia Awards scholar Mr Cheten Tshering from Bhutan is pictured (centre) with Ms Kinley Wangmo, an alumna from Bhutan who recently returned from Australia, sharing her experiences and advice about life in Australia with the new recipients. 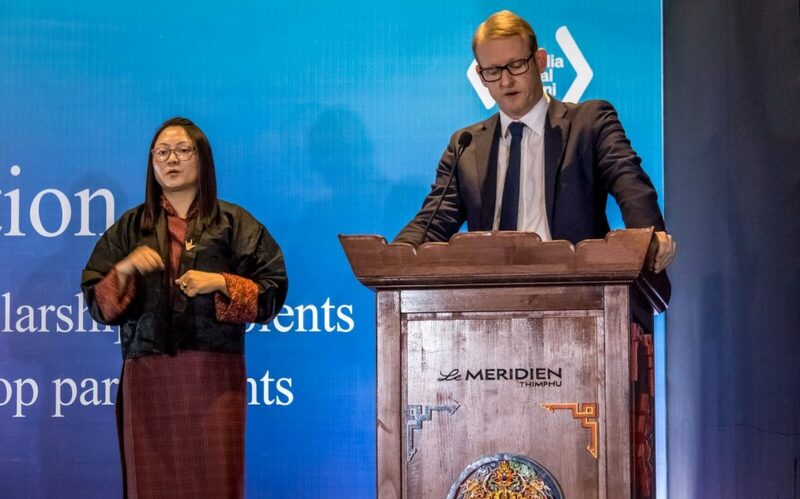 Australia Awards employed a sign language interpreter in Bhutan during a reception held to congratulate the new scholars. Addressing the reception is Mr Rod Hilton, the Deputy High Commissioner to India and Bhutan. Mr Phuntsho Pelgay - Australia Awards alumnus, Mr T R Vishwanathan - Senior Program Manager, Australian High Commission in New Delhi, Ms Zangmo Dukpa - Australia Awards alumna, and Mr Rod Sollesta, Deputy Team Leader, Australia Awards – South and West Asia at the Pre-Departure Briefing. Australia Awards Scholarship recipients from Nepal with (starting 2nd from L – R) Ms Ainsley Hemming - Head Development Cooperation, Australian Embassy in Nepal, Mr Tek Bahadur - Under Secretary, Minister of Finance in Nepal, Tony Crooks - Team Leader, Australia Awards – South and West Asia at the Pre-Departure Briefing. Drishya Gurung, Australia Awards recipient from Nepal receiving the Australia Awards certificate from HE Peter Budd, the Australian Ambassador to Nepal. Prior to accepting her Australia Awards Scholarship offer, Drishya was offered another international scholarship. She opted for Australia Awards. (2nd from L-R) Australia Awards alumna, Mr Nasrul Hamid, Hon State Minister of the Ministry of Power, Energy and Mineral Resources, Australian High Commissioner to Bangladesh HE Julia Niblett, Chief Guest, Australia Awards alumna Ms Rani Yan Yan, Chakma Rani (Queen of the Chakma Circle), together with new scholars at the Farewell Reception for the departing Australia Awards recipients. Ms Zarin Yesmin Chaity, Bangladesh is pictured far right with fellow Australia Awards recipient from Bangladesh at the Farewell Reception in Bangladesh. Mr Obaidullah Khan is the youngest among this year’s Scholarship recipients in Pakistan. He is a Digital Agriculture Expert at Telenor Pakistan, one of the biggest telecom sector companies in the country. He has already been promised a position in his company upon his return, which is rare to see in the country’s private sector. Australia Awards Scholarship recipients from the Maldives with Deputy High Commissioner, Sri Lanka and the Maldives, Ms. Victoria Coakley and Second Secretary at the Australian High Commission, Mr. Daniel Fisher, at the Pre-Departure Briefing held in Male, Maldives. Ms Fathima Shimla, Australia Awards recipient from Sri Lanka, speaking at the Pre-Departure Briefing.